The final weeks leading up to Easter are a wonderful time for families to gather around the Bible and consider the life of Christ. This family-oriented scavenger hunt is for families to engage with Christ while also spending quality time together. After they find each “clue” the family takes a selfie together with the object they found so by the end, not only do they have fun, faith-filled memories, they have seven new family pictures. John the Baptist baptized Jesus in the Jordan River. See if you can find a stream, a pool, or a river, anything with water for your family selfie. Take some time to think about what happened when Jesus was baptized, how God spoke from Heaven and what John said about Him. Jesus went to places where people were, to talk to them about God’s Love. If Jesus were here today, where do you think He would teach? Take a picture of your family in the place you thought of and write down a little explanation of why you picked that place! News of Him spread around Israel with speed. There are many stories of Jesus’ miracles in the Bible. With your family pick your favorite story and read it together. There are several ways to take your family selfie—you can all point to the Scripture reference and take a pic; you can re-enact the story and take a pic; or you can take a video of your family reading or telling the story! And shared what would happen; it seemed so unreal. During the Last Supper, Jesus explained He would die and rise again, but the disciples didn’t understand His words. It was here that Jesus first described communion—the bread representing His body and the juice representing His blood. After this, He left and went to the Garden of Gethsemane to pray before the soldiers came to arrest Him. With your family, go find a garden or a patch of flowers. Take your picture together and consider how just a few weeks ago this ground was cold and dead, but today there is hope and new life. Jesus came that we might have new life and have it for all eternity! When Jesus died on the cross, His disciples and His friends lost all hope. But God had a bigger plan. A beautiful plan that was way bigger than they could see in that moment. 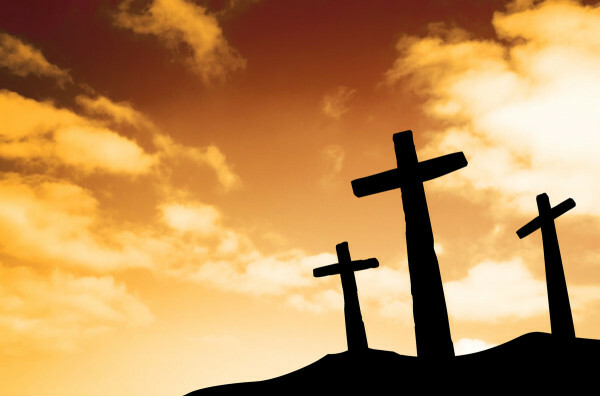 We remember the cross as a place of suffering, but also as a place of hope for all eternity. With your family, find a cross, take your picture, and talk about how we can have hope in Jesus. Our greatest hope comes in knowing we will get to spend all of eternity with Jesus and with all who follow Him! We don’t have to be slaves to sin. Jesus can help us to live with joy and life now. That is what Easter is all about! Take a picture of your family celebrating with GREAT JOY that Jesus is ALIVE!